An advisory panel will submit recommendations in July, and some think the turnpike authority can ease projected congestion in the Portland area without a massive construction project. The Maine Turnpike Authority projects that if nothing is done, growing traffic on the stretch of Interstate 95 between Scarborough and Falmouth will create serious peak-hour traffic problems at some exits within seven years. Some transportation and environmental advocates are urging the Maine Turnpike Authority to pump the brakes on apparent plans to widen a stretch of heavily traveled highway around Portland. The authority appears prepared to add two travel lanes on up to 11 miles of the four-lane highway, but some want the agency to consider all other alternatives before committing to the multimillion-dollar project. Other critics point to academic research that shows building more highways doesn’t alleviate traffic – it creates more. “We have a duty to consider all the options on the table and not have a preconceived conclusion,” said Kristina Egan, executive director of the Greater Portland Council of Governments, a regional planning group. Egan is part of a 19-member public advisory committee convened by the authority and tasked with looking into solutions for future traffic congestion in the Portland area. Committee members have asked for more analysis of whether new lanes would invite more traffic and whether a package of traffic-easing measures could achieve the same result. 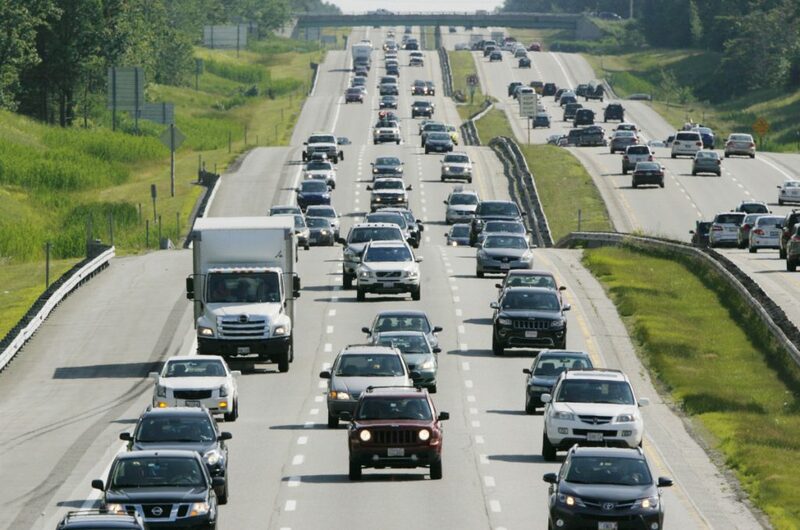 The authority projects that if nothing is done, growing traffic on the stretch of Interstate 95 between Scarborough and Falmouth will create serious peak-hour traffic problems at some exits within seven years, and along the entire Portland mainline by 2040. A draft analysis put out earlier this month indicated that of 15 alternatives, widening the highway, at a cost of at least $142.7 million, was the only option that would fully deal with capacity issues. The advisory committee is expected to release its recommendations in July. 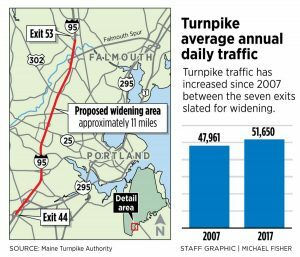 Turnpike officials are inviting public comment on the issue and will present the draft findings to the Portland City Council on Monday and to the Falmouth and Westbrook councils on June 18. The committee’s analysis satisfies a legal requirement for the turnpike authority to demonstrate that new traffic lanes are needed and justify the construction to environmental regulators, said Peter Mills, the authority’s executive director. The authority is authorized to build new highway miles under a 2007 state law. “The plan is to do something about the congestion that is compromising our fundamental mission, which is to provide an open road,” Mills said. About $57 million has already been allocated to the authority’s four-year capital plan to modify four highway bridges around Portland to accommodate a wider highway. In an interview this week, Mills said the agency expects to begin applying for construction permits by the end of 2018. Other alternatives, such as increased public transportation and freight rail, ride-sharing incentives and peak-travel pricing, were considered but wouldn’t have the same impact as two new traffic lanes, Mills said. Some measures would divert drivers and create traffic problems on secondary roads, including Interstate 295, which already has congestion and safety issues. Widening sounds like a good idea to Gordon Davis, 66, who came to a thinly attended open house on the committee’s work at the Maine Mall on Thursday. Davis, who commutes to work in Portland from his home in Lewiston, said most of his siblings live in Southern California so he knows how bad congestion can be. There are reams of scholarly research that contradict the premise that more highway means less traffic. Results from similar studies in Japan and Europe were “weirdly the same,” Turner said. His inspection, which looked at new highway from 1980 to 2000, also showed new highway miles quickly became congested with added vehicles. Congestion pricing was considered by the authority, but in an analysis the agency said the measure is illegal under Maine law, would not remove enough vehicles from the highway during peak times, and would divert drivers onto secondary roads. The authority hasn’t accounted for induced demand in its analysis, said Phelps Turner, an attorney from the Conservation Law Foundation who has followed the committee’s work closely. “We fear we will be back in the same place five to 10 years from now and they will be asking for more lanes then,” Turner said. The alternatives considered by the committee were only examined as individual steps – how they might work if combined wasn’t discussed, Turner added. Other measures, such as electronic signing, using road shoulders as peak-time travel lanes, or discontinuing an E-ZPass volume discount program, haven’t been considered at all, he said. “If we pursue multiple alternatives in combination, I think we can alleviate the congestion the turnpike is trying to address with the lane expansion proposal,” he said. The advisory committee has asked the authority for a new analysis that accounts for future traffic created by new highway lanes and whether a collection of alternatives could have the same impact as new highway lanes. The authority is also examining a rapid-transit bus service along the stretch of highway in question, said Greg Jordan, general manager of Portland’s Metro bus service. Results are expected at the committee’s next meeting, June 19. A broader multi-agency approach to dealing with transportation issues in Greater Portland would be an “outstanding outcome” of the turnpike study, Jordan said. “We all do a better job in the region when all of us can work together and collaborate and find a way to improve mobility,” he said.